Located in the heart of Orlando, less than a mile from the Walt Disney World theme parks, Disney Springs , Premium Outlet, and Universal Studios , we are only minutes from world-class attractions, championship golf courses, excellent restaurants, and premium shopping.Meet at one of our two outdoor pools or at the tranquil Top of the Palms Spa for a treatment or simply to relax. Gather in one of our expansive event spaces for your next meeting. And computer workstations, located in the lobby, make it easy to stay productive while traveling. Our spacious 486 rooms, including 92 suites, ensure comfortable rest. Step out onto a private balcony or patio, and soak up the sun with city or pool views. Enjoy the flat screen TV from your Sheraton Signature Sleep Experience bed and stay connected with High Speed Internet Access. Theres plenty to see and do in the worlds most famous tourist destination. In addition to the Walt Disney World Theme Parks, try out Universal Studios and Universals Islands of Adventure just down the road. Visit Shamu at SeaWorld Orlando, or take a swim with the dolphins at Discovery Cove.If you would prefer to golf, there are plenty of beautiful courses nearby to choose from. 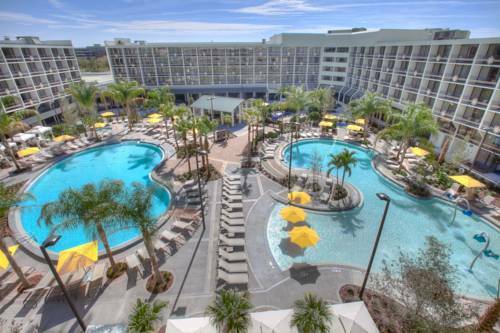 Or shop at the two factory outlet malls, located within a few miles of our hotel, the Disney Springs area less than one mile away, or two large malls less than 10 miles away. Springboard Marketplace makes it easy to make the most of your time with grab and go beverages and snacks available all day. Gather at the communal table and work for awhile, or grab your favorite Starbucks beverage for the afternoon ahead. Relax into this sunny and stylish space, and taste freshly prepared foods flavored by Florida s famous citrus fruits. After sunset, Zest transforms into a colorful lounge where you can enjoy icy signature drinks and hot contemporary cuisine. Soak up the sun while dining outdoors at our lively poolside restaurant and bar. This breezy open-air restaurant features fresh light fare, enticing signature cocktails, and exciting activities daily until dusk.